Ahoy, Legends fans! You'd better believe that if I were better at talking—er, typing like a pirate, this entire post would be done in dialect. So count yourselves lucky that pirate-speak is not something I'd include on my particular list of skills. In my defense, it's really not something I'd include on Amaya's list of skills either, and she seems to have done pretty okay. This week's episode was really sort of a three-for-one deal. The pirate adventure was definitely the most action packed, for sure, but at the same time we had Sara and Ava's date and Rip and Wally's...uh, karaoke extravaganza, so you know we've gotta talk about those things too. But before we get into any of that, we should probably address the pressing, Mallus-related stuff going on. The good news is, we've now got the Earth Totem locked down. The bad news is the Earth Totem is apparently some sort of parasitic entity that will just overtake whoever is wearing it. So...that's potentially a problem, considering these totems are likely going to need to be used somehow in order for anyone to take Mallus on. We also learned this week that the Fire Totem is, apparently, destroyed—at least for now. So it's not a pressing issue at the moment. That'll probably change considering all the time travel going on, but it's not looming over us right now. Unfortunately, we still have no real idea what the mysterious sixth totem is or what it does. A couple weeks ago, I guessed it would be something like metal, but I'm revising my guess now. And no, I’m not changing it to “heart,” for any of you Captain Planet fans, though I suppose my new theory isn’t too far removed from that. I think, maybe, the sixth totem isn't a necklace or a gem, but some sort of person or combined energy from the other five. I don't really have a ton to base that guess off of and there's a good chance I've just seen The Fifth Element a few too many times, but really, if the sixth totem really were just another piece of jewelry, why wouldn't Amaya's tribal history talk about it at all? So Amaya's pirate skills kind of left something to be desired, but unsurprisingly Mick's were pretty top notch. I'm absolutely in favor of this new, fun Mick-and-Amaya friendship that may or may not be blooming (which is pretty welcome, considering how over Amaya and Nate's whole thing I am. Please give her some other people to interact with!). 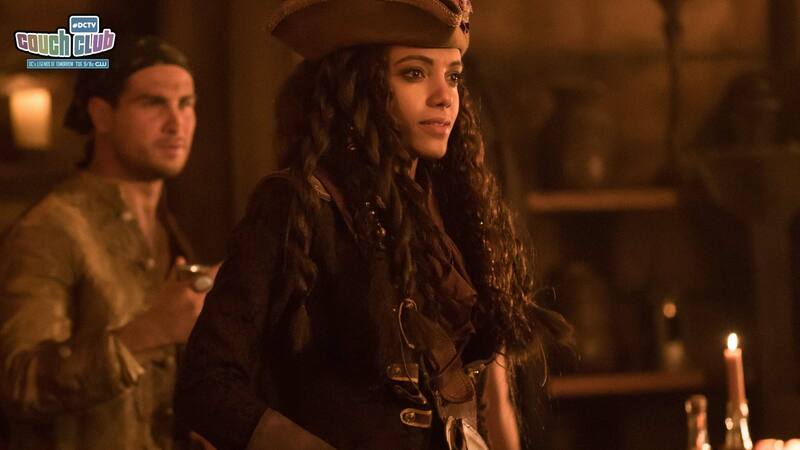 But all of that being said, the real takeaway from the pirate half of the adventure tonight has less to do with the Dread Pirate Jiwe and more to do with Ray, who couldn't live with himself killing Nora, despite...well, everything. It's pretty crazy how sympathetic Nora has become to me since she's been introduced because I can't even be mad at Ray for making this call. Sure, her dad is evil and she's possessed by a demon threatening to tear reality apart, but she's really a victim in all of this too. To really ice the cake of this moral quandary, Wally and Rip are out there having maybe the best vacation ever, while Sara and Ava try and fail to be normal people on a normal date. So, you know, a regular Monday for the Legends, really. But hey, with Wally sufficiently convinced to join up with Rip, and Ava and Sara giving things a real go, I’m feeling pretty good about the crew's roster of allies for the rest of this season. I mean, at the very least, even if they fail with the whole Mallus thing, at least we know some of them have a pretty great karaoke career ahead of them.